This story was first published on the HEART blog. Community health workers in Mozambique are paid by development partners and not by the Government. How does this affect their integration into the broader health system? How can we incentivise supervisors in Malawi to support community health workers in a positive way? Sometimes donors’ desire to take action on particular health issues can mean that community health workers are overburdened with an ever growing portfolio of tasks. What guidance can you give donors on playing a more supportive role in programming? Can we produce generalizable evidence on close-to-community providers when there are such a wide variety of people playing this role in very particular settings? These are just a sample of the questions that were posed when we met with the UK Department of International Development health advisers this week. Meeting with DFID was a great opportunity to update them on how the REACHOUT research is coming along but also to hear directly from them on the type of issues that they are dealing with. REACHOUT is operating in six countries to try and improve the equity, efficiency, and effectiveness of close-to-community health projects in collaboration with a wide-range of stakeholders. The research is timely – community health workers are gaining increasing attention at international level and the push toward universal health coverage is encouraging different governments to explore different models of community health delivery in the light of the human resources for health crisis. Close-to-community providers (which could be informal providers, community health workers, health extension workers) are embedded in communities, can see what happens in the home, and can link this learning and perspective to the broader health system. However they face challenges. There is a great deal of expectation placed upon them, they may have received little formal education or training and they are often under-supported by health system staff and structures and receive varying incentives. The quality of the evidence on close-to-community providers varies. There are few studies that cut across different health issues and generate learning from different settings, few programmes that track progress over time and results from studies can be difficult to generalise across different contexts and countries. These are some of the issues that REACHOUT is attempting to overcome whilst building the capacity of health system actors to evaluate the benefits of improvements to close-to-community programmes. In our dialogue with DFID we all reflected on the challenges faced by community health workers in terms of expanding workload. For example in Mozambique there is talk of expanding the role of community health workers to cover new issues such as HIV and family planning, reflecting both Ministry of Health but also donor priorities. It is our experience that the desire to rationalise and harmonise vertical health programmes has sometimes seen an increased workload for close-to-community providers and as a result a cadre of people with only a couple of weeks training sometimes become the common delivery pathway for a whole host of interventions. This has implications for training, remuneration and supervision. Donor coordination may be important here also having a range of research to draw from, since no single study will give the definitive answer on the best approach in every setting and for every situation. The Thematic Working Group on Community Health Workers, in Health Systems Global, is one such useful avenue for creating dialogue between donors, researchers, policy makers and implementers in this area. Challenges with supervision have arisen in many of the REACHOUT contexts. Close-to-community providers often complain that they have too little supervision or that it is focussed on fault finding. But supervisors need support too! Some of the ways of incentivising good practice include: group approaches to supervision; the celebration of good practice; interventions that try and spread innovative ways of working among supervisors across the health system. These needn’t be expensive – people value non-financial incentives as well as pay increases – but they do require buy-in from all actors. In settings like Malawi community health workers move between different programmes run by NGOs and this fragmentation of interventions may create challenges. Producing research which is generalizable across, and useful for, a variety of settings is a challenge. There is a balance to be struck between conducting in-depth case studies and finding issues in common across different settings. In REACHOUT we are trying to overcome this challenge by testing interventions which respond to common health systems concerns – supportive supervision, effective community engagement, communication across different actors and building strong referral systems. We are just about to embark on the first of our quality improvement cycles in Mozambique, Ethiopia, Indonesia, Bangladesh, Malawi, and Kenya. We will be sharing lessons on what works well and some of the difficulties we encounter as we go. International Development Minister Lynne Featherstone meets with a newly qualified Community Health Assistant and travels with her to a household in a rural location. 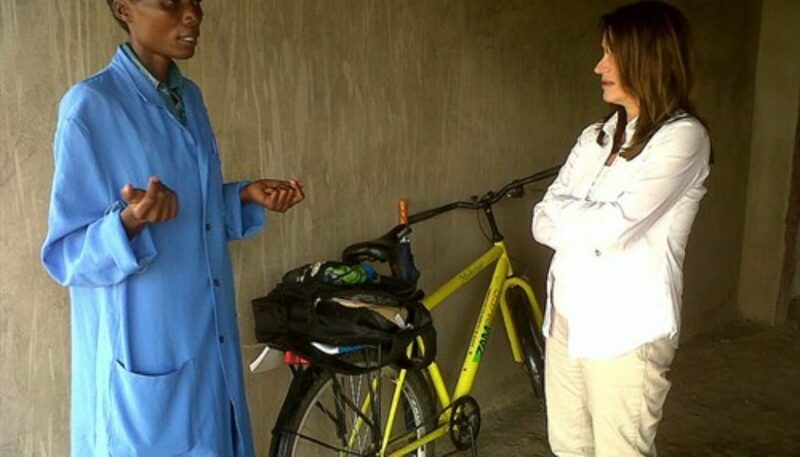 The assistant shows the Minister her bike, provided by the Ministry of Health in Zambia, which she uses to visit rural families in Monze, Southern Province. UK aid is training a new cadre of 300 Community Health Assistants to deliver health services in rural areas.